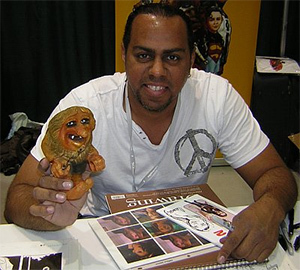 Georges Jeanty, a Miami native, started drawing for independent companies like Caliber, London Night and Chaos comics, and then began working at DC on titles like Superboy, Green Lantern, Wonder Woman, Superman, and Teen Titans. Georges then sashayed over to Marvel and lent his daring style on titles like Gambit, Deadpool, Wolverine, and Weapon X. There was also Wildstorm titles like Majestic and the critically praised creator owned the American Way written by Oscar winner John Ridley. From one award winning creator to another, Georges was then recruited by Joss Whedon to start work on the continuing adventures of Buffy the Vampire Slayer with the start of Season 8 and 9 to critical praise for Dark Horse comics. Not to be left out, Joss then moved Georges over to his other franchise Serenity which chronicles the crew of the Firefly after their exploits from the motion picture. After finishing that 6 issue mini series he's now set up shop at DC once again sharing art chores on their 52 Issue maxi-series, Futures End involving all the characters in the DC Universe.